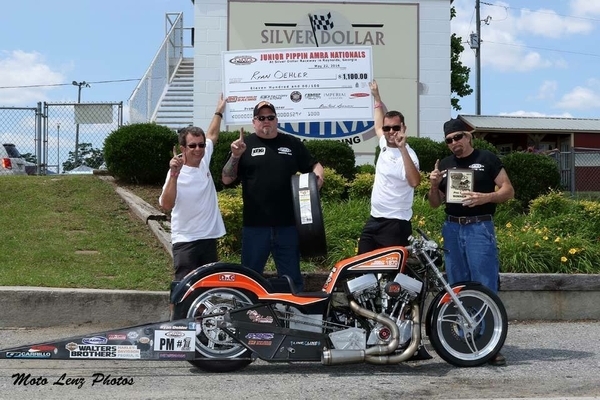 This past weekend, Silver Dollar Raceway located in Reynolds Georgia, hosted the inaugural Junior Pippin Nationals. 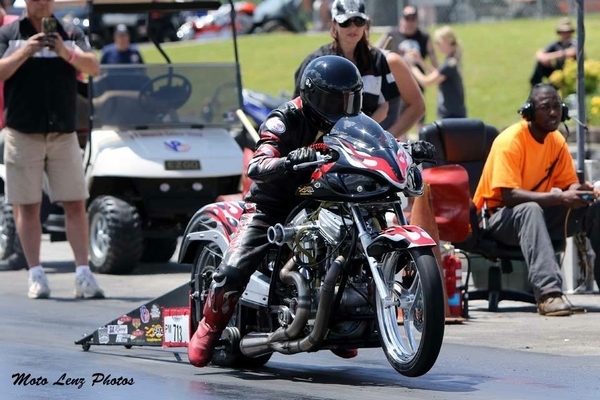 The ProMod’s of the AMRA put on one hell of a show and boasted a packed field of high horsepower premier Harley drag bikes. This was a very special event as we showed tribute to Junior Pippin who continues to be a legend in the sport of Harley drag racing. Junior and Chip Ellis were present along with several Pro Stock teams, who not only put on a great show but also got some good conditions for testing. 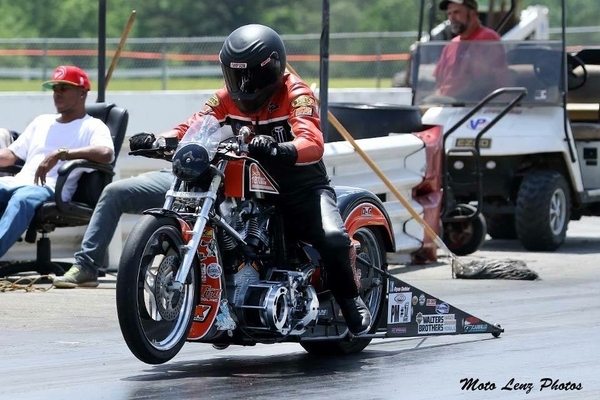 The AMRA ProMod’s had their biggest field to date proving that this class continues to grow and edge their way closer to a sixteen bike field. PR Factory Store was the main sponsor of the event along with Capone Racing, B&K Cylinder Heads, Ryan Oehler Racing, Moto Lenz Photo’s, Imperial Vanners, and Fogler Signs. With the help of these sponsors the ProMod Class would duke it out for another big check, race tires from PR Factory Store, and of course bragging rights! 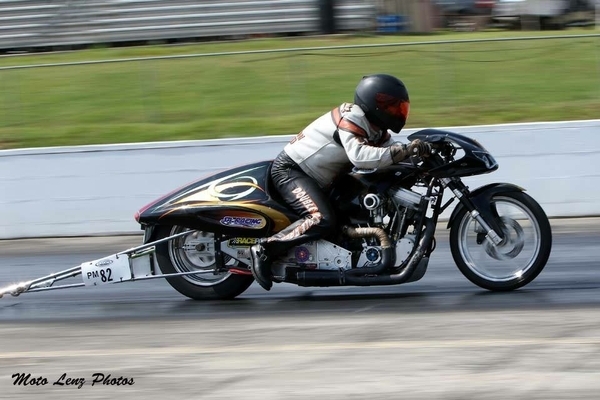 Saturday’s qualifying was nothing other than impressive for this ProMod class. Shane Pendergrast and crew chief John Arnold laid down the quickest pass for the third race in a row and took the number one spot proving that they were not here to play but here to win. 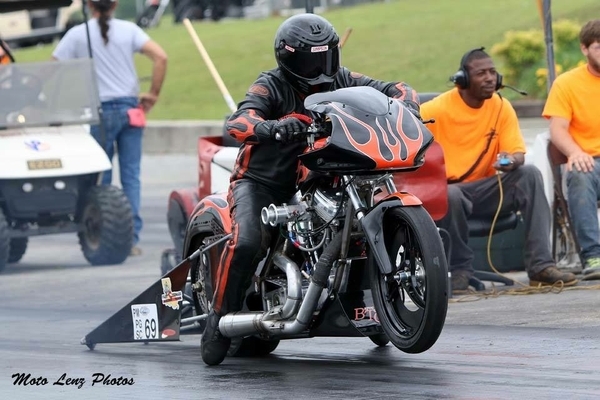 Rookie Clayton Danford and crew Chief Larry Pratt took the number two qualifying spot and showed that they were ready to compete for the big money of the ProMod class. Gary Douglass laid down some very impressive numbers and took the number three spot. Mr. Consistent, Jerry Lee Cloyd took the number four spot in this qualifying ladder and continues to fight his way to the top in this very tough class. 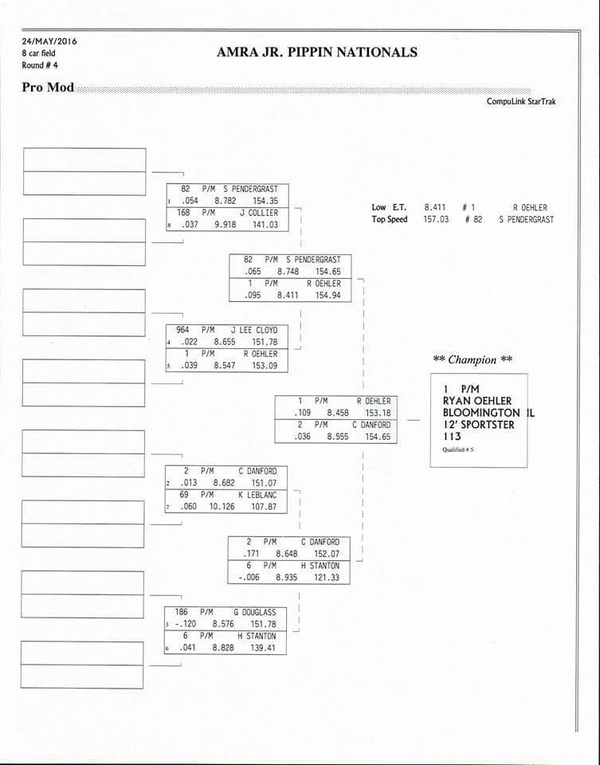 Ryan Oehler struggled during qualifying and barely got in the show with his final qualifying pass. Ryan had some possible voodoo placed on him from some of his southern rivals and smoked several of his electronics and wiring during round two of qualifying and had to completely rewire the bike between rounds. Henry Stanton also struggled during qualifying but was able to secure the number six spot. Henry would hopefully figure out what was up with the loss of his big end charge before the weekend was over. Kyle Leblanc has made some progress and is getting closer to figuring out his new machine and took the number seven spot. Justin Collier built an entirely new bike for this class in less than three weeks. That’s how hungry this ProMod class can make a guy. Justin took the number eight spot and had to shake down some gremlins from his new ProMod machine. Jason Adams the local favorite rounded out the class during qualifying but had serious problems all day on Saturday. Jason threw the main belt drive belt off the bike two passes in a row and would have to make some serious repairs to get back in the show for this very tough ProMod field. Sunday! Sunday! Sunday! 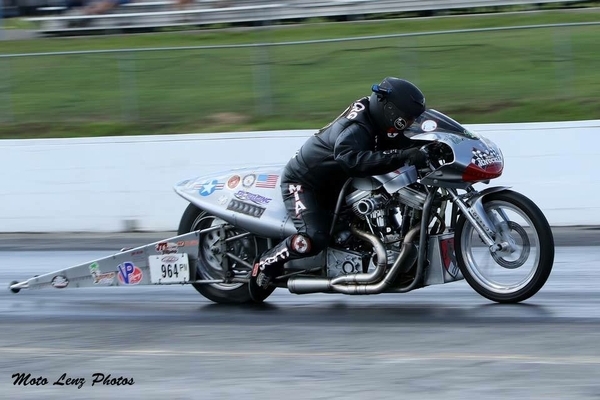 Come see the world’s fastest gas Harley drag bikes tear down the track at the Junior Pippin Nationals. It was time for eliminations and the ProMod class was called to the staging lanes. Jerry Lee Cloyd and Ryan Oehler matched up first. Jerry was out in front but didn’t have enough to take down Ryan and Bad Brad’s horsepower. Ryan took the win 8.54 at 153.09 mph to Jerry’s 8.65 at 151.78 mph. Ryan and Brad had worked late into the night rewiring their machine, and it was obvious that they had found the bugs that had been plaguing them on Saturday. Next up was Shane Pendergrast and Justin Collier. Shane got really sideways but still had plenty of power to take the win. Shane runs and ET of 8.78 at 154.35 mph to Justin’s 9.91 at 141.03 mph. Moving to the water box next was Clayton Danford and Kyle Leblanc. Clayton gets a great reaction time of .013 to Kyle’s .060. Clayton makes it to the finish line first and runs an ET of 8.68 at 151.07 mph to Kyle’s 10.12 at 107.87 mph. Rounding out the first round of eliminations was Gary Douglass and Henry Stanton. Gary must have been a little excited and goes red giving the win to Henry Stanton. 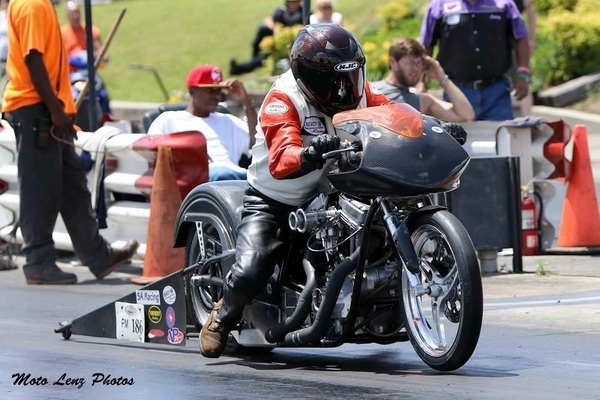 Gary had a great pass going and runs 8.57 at 151.78 mph to Henry’s 8.82 at 139.41 mph. The semifinals were upon us. Ryan Oehler faced off with teammate Shane Pendergrast. Both bikes left together, Shane got a little loose in the right lane, but Ryan lays down a blazing pass with an ET of 8.41 at 154.94 mph to Shane’s 8.78 at 154.65 mph. Ryan moves into the finals after just running the low ET of the event so far. Next up we have Clayton Danford paired up with Henry Stanton. Henry knew he had to cut a good light but unfortunately goes red and runs and ET of 8.93 at 121.33 mph to Claytons 8.64 at 152.07 mph. Ryan and Clayton find themselves matched up in the finals again. Ryan beat Clayton in the finals a month ago at Bowling Green’s Beech Bend Raceway. The crowd watched with excitement as these two approached the line. Clayton was out first but Ryan’s bike took off like a rocket. Ryan makes it to the finish line first and run’s an ET of 8.45 at 153.18 mph to Clayton’s 8.55 at 154.65 mph. 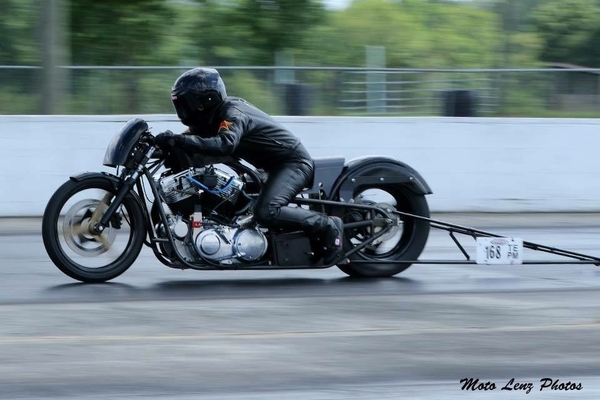 Great drag race, these bikes were locked all the way down the track. 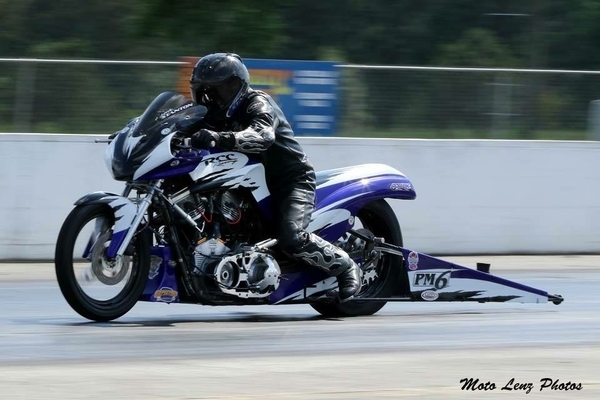 The ProMod class of the AMRA continues to impress everyone with amazing side by side drag racing. The next AMRA event will be held back at Bowling Green’s Beech Bend Raceway on June 25-26. 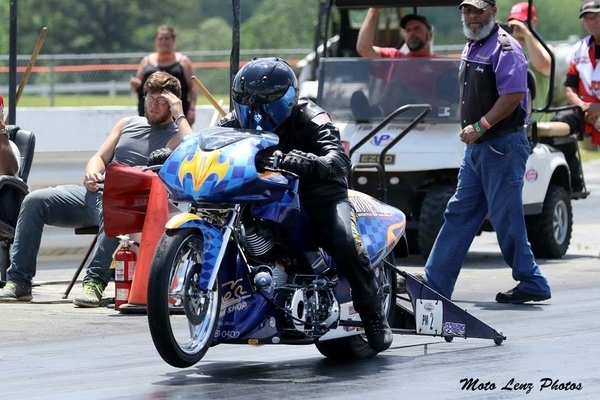 Come check out the world’s fastest Harley drag bikes!